National Coordinator of the Strike Force, Deputy Comptroller Abdullahi Kirawa, said the four suspects were arrested in connection with some of the seizures, as result of false declaration to outright prohibition, and they are presently on administrative bail, awaiting prosecution. While showcasing the items to newsmen in Lagos over the weekend, Kirawa, said the seizures were made between January 1 and March 30, 2019 in Zone A, which covers South-Western Nigeria. He revealed that the other items seized included 304 cartons x 150 packets of imitation jewelry worth N36.5 million (declared as bead mold), a unit each of Toyota Avalon (N2.5 million) and MAN Diesel truck (N8.5 million), 1698 pieces of used tyres (N8.5 million), and 952 cartons of rubber footwear and 140 cartons of rubber soles worth N13.4 million. 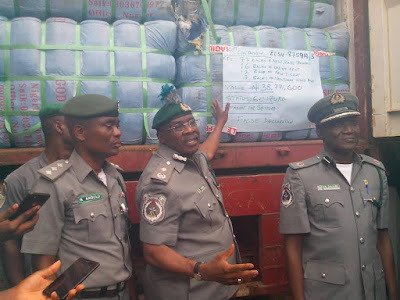 There were also 400 cartons of HP Desktop and Monitor worth N55.4 million, 562×50 bags of 1kg Indian Rice and 50 bags x 50pcs of 1kg salt worth N59.9 million, bales of new and old jeans trousers, shirts, ladies’ gowns, belts and handbags, and bales of upholstery materials, among others. Meanwhile, Kirawa lamented that due to ignorance and unnecessary risk, importers lose millions of naira to outright seizure of non-contraband simply over false declaration, rather than honest declaration and payment of right duties. According to him, the pirated jewelries were “not contraband but can be imported if you pay the correct duty. It was seized because its importation is contrary to section 46 of CEMA; apart from being containerised, there is concealment and the entry made was wrong. He advised all citizens to engage in meaningful ventures, and collaborate with the agency to keep the country safe and ensure that the due revenue accruable to the government is collected.